Barry Dmytro | The personal life of Barry Dmytro. The personal life of Barry Dmytro. In just a week and a half from today the construction of our cabin is going to start. We were pretty scared there for a while, but as we are getting closer to the date everything is starting to fall into place. We have a stove ordered and a shipping location arranged, a source for materials to put the stove on, a good idea of where we want to cabin to be built, insurance arranged, a loan arranged, a place to stay during construction, and many things to take up with us to initially furnish the cabin. Today we purchased a few solar lights and an outdoor propane burner. We intend on using the burner for outdoor brewing and possibly canning. The solar lights are for lighting the cabin of course. We also plan on taking our hammock up with us and hanging that up in the cabin as soon as we can. We still haven’t quite figured out a number of other details, such as building a composting toilet, refrigeration, using the blender, firewood, driveway, well location, garden location, solar panel plans for the future, as well as many other things to consider. Most of these we’ve put a lot of thought and research into so far and when the time is right I think they will fall into place. I am glad that the fear is turning into excitement and think that the cabin building will go well. The weather is also starting to get dry and warm to our benefit making the transporting of materials into the field easier. 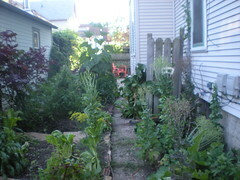 Here is our garden in early august. We reworked some beds and planted fall greens. Other places lettuce seeds, tomatoes, amaranth, orach, sunflowers, and sunchokes are doing well. We’ve harvested seeds for lettuce, many asian greens, and onoins. For herbs we picked wormwood, mugwort, and hops all for brewing. 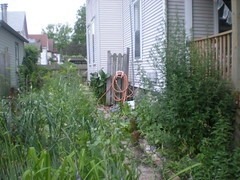 This is what the garden looks like at the end of June. Many things are at their prime waiting harvest. Kind of jungle like right now, but a huge improvement over what it used to look like. Check out the picture from the past. 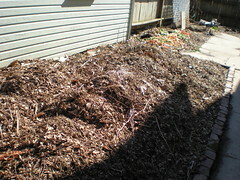 Garden as a compost pile. Things rather full in this small garden. Mugwort, garlic and mustards abound. Soon this will have be harvested out and replanted. It will look new and fresh again. Our garden is doing very well this year. Already in may we are getting lots of harvest. Compared to last year when nothing would still grow here. We did a great job of taking a useless area and turning it into a beautiful garden. We’ll have more pictures of the progress to come and check out some of the pictures from the past. With the last two years of working on our farm we planted apple and plum trees. 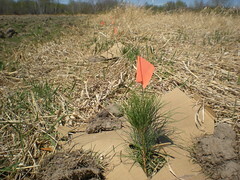 This year during the second week of April we planted wind break trees and hop vines. For wind breaks we got 100 American Red Pine and 100 Colorado Blue Spruce and planted the along the northern border of our land. 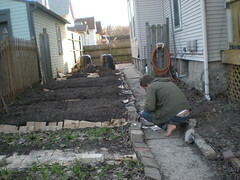 We also planted 20 hop vines, 5 different varieties: Cascade, Magnum, Perle, Fuggle, and Northern Brewer. Also when were working on this we were talking with a building about a cabin, and also to someone for putting in a well and someone to finance it all. Things are set in motion and we plan on building a cabin on our land this fall and moving into it sometime in the next year. Everything will be off of the grid, and we will try to to live and farm in a sustainable fashion. Planting first crop of the spring. This was a couple of weeks ago and is was a very warm march, one of the warmest in recent memory. We had had average temps of 50 to 70 (degrees Fahrenheit) for 3 weeks now and 2 weeks without rain. Both of the lakes were completely thawed out, maples were flowering, and our onions we starting to grow. We worked up our beds beside our house and formed them into raised rows in one of the earlier spring heat waves, and planted them on this occasion. We planted with many Cold Hardy Crops: Ruby Mustard, Spinach, Lettuce, Amaranth, WCC Cress, Diakon Radish, French Breakfast Radish, Peas, Bok Choy, Mibuna, Hon Tsai Tai, Arugula, Dill, & Orach. A bit later we planted in our community garden Lacinato Kale, Red Russian Kale, Curly Kale, Napa Cabbage, Red Cabbage, Curly Parsley, Flat Parsley, Rainbow Chard, Collard Greens, Burssels Sprouts, Spinach, and Plantain. 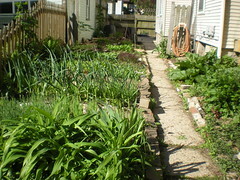 At this point most everything has sprouted at our home garden, but haven’t checked on the community garden recently. We started watering our home garden right away, but relied on the rain for the community garden. At this point is has been raining for 3 days and our home garden is flourishing at this point. At this point I have hight hopes–hopefully it will do well.